Most of the time, we all know that it’s annoying and confusing which type of printers are suitable for your needs. There are a lot of factors to be thought over, such as whether it is inkjet or LaserJet printers, multifunction or single function, color or monochrome, which brands of printer, etc. 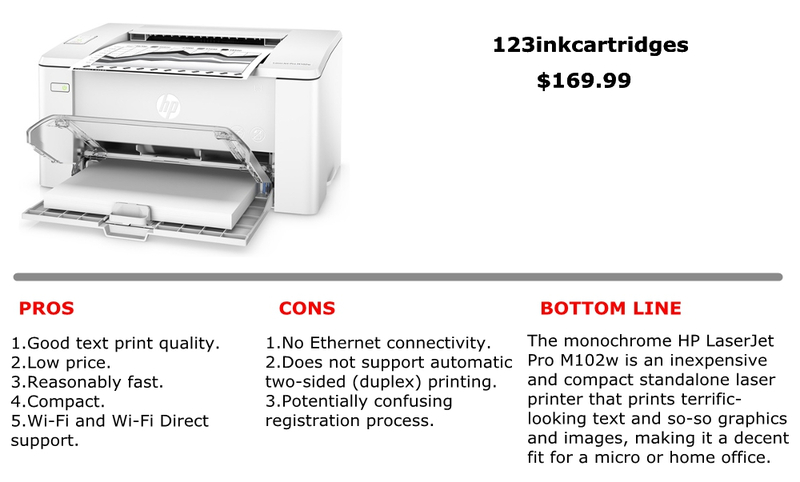 Don’t miss a great deal from 123inkcartridges for HP LaserJet Pro M102w! Only at $169.99 can you get such a good printer. If you need a single-functional monochrome laser printer with an affordable price on cartridges, this will be the perfect choice for you! Hurry up to click 123ink.ca to have this big deal and don’t make a regretting decision. HP LaserJet Pro M102w is a cost-effective single-functional monochrome laser printer with 600 x 600 dpi resolution and media sizes up to 8.5″x14″. It’s designed for efficiency that you wait less with HP LaserJet Pro M102w that prints faster than its predecessor up to 23 pages per minute. And print first pages in as fast as 7.3 seconds. It’s designed for efficiency that you wait less with HP LaserJet Pro M102w that prints faster than its predecessor up to 23 pages per minute. And print first pages in as fast as 7.3 seconds. Print from iPhone® and iPad® with AirPrint®, which automatically scales jobs to the correct paper size. With the features, it is much more suitable for individuals and small work teams who need a personal black-and-white LaserJet printer to print. A good printer needs a good partner —— toner cartridges. toner cartridges always are divided into two types, OEM and remanufactured cartridges. 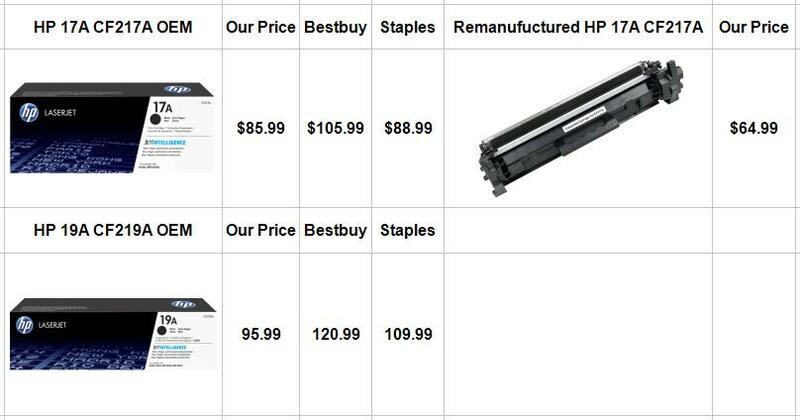 These two types toner cartridges have some differences. OEM is the original products from the manufacturer. Remanufactured cartridges are recycled from original cartridges and have been refurbished by a factory with many steps strict process to ensure the quality will meet the same standards as its OEM counterpart. HP 17A CF217A Original Black Toner Cartridge and HP 19A CF219A Original Black LaserJet Imaging Drum are the matching toner and drum for Pro M102w. The price between these two types is also different. Remanufactured HP 17A CF217A Black Toner Cartridge which is new arrival is sold of $64.99 on our website. And HP 17A CF217A OEM is sold of $85.99. Compared to the OEM, the remanufactured has more advantage at price than the OEM one and contains at least the same amount of toner as the original genuine cartridge. Integrated with all aspects, buying the remanufactured on our website is the best choose for you to save on both money and time. 123ink.ca ensures that all of its products are guaranteed to meet all of your satisfactions. We are willing to offer you the best service and offer free shipping for all the orders above $49. Let click in 123ink.ca, enjoy the fun of shopping online!